Do you ever want to quickly clean and shine your paint without having to do a full wash, dry and then protect the surface? The Optimum Instant Detailer is the perfect product for this step. Spray it on your vehicle's exterior and wipe the surface with a clean microfiber towel to safely remove particles and leave a great shine behind. The secret to this extraordinary product is the flouropolymers that encapsulate particles and help you remove them from the surface without grinding them in to the surface. This helps greatly minimize the possibility of adding in swirls or other micro-scratches that often come from washing and cleaning your paint. Simultaneously it leaves a layer of polymers that make the surface feel ultra slick and look very glossy. Just spray it on your paint and wipe the surface with a microfiber towel and your all set. Upon completion the paint will be clean, protected and shinny! Maximize your value with the concentrated 32 oz and 128 oz sizes, by diluting them to a 3:1 ratio. 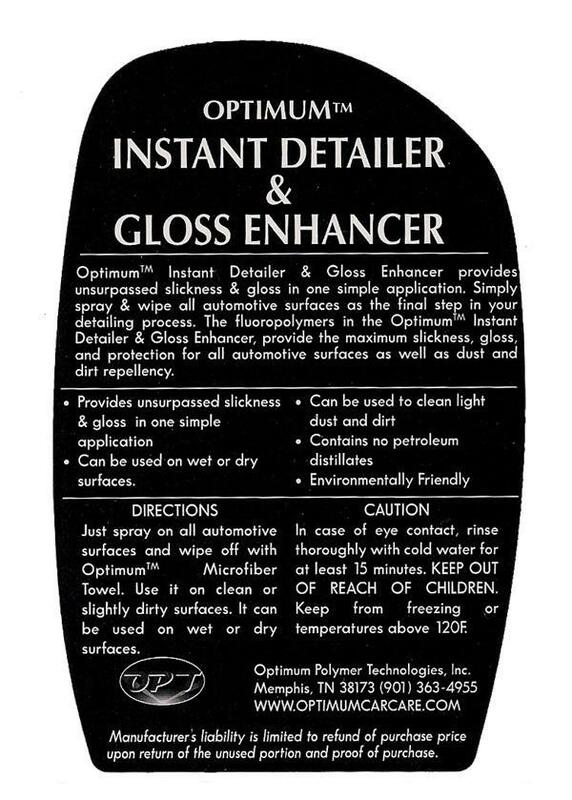 The Optimum Instant Detailer is an outstanding quick detailer that every detailer can use. 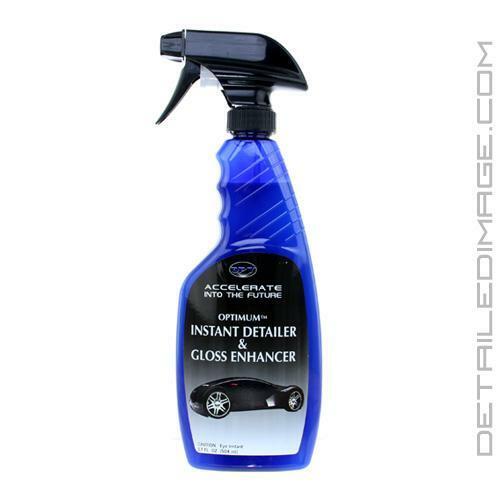 Optimum Instant Detailer & Gloss Enhancer provides unsurpassed slickness & gloss in one simple application. Simply spray & wipe all automotive surfaces as the final step in your detailing process. The fluoropolymers in the Optimum Instant Detailer & Gloss Enhancer, provide the maximum slickness, gloss, and protection for all automotive surfaces as well as dust and dirt repellency. Just spray on all automotive surfaces and wipe off with Optimum Microfiber Towel. Use it on clean or slightly dirty surfaces. it can be used on wet or dry surfaces. I love this stuff, it goes a long way when diluted per the instructions. I use it whenever I'm drying my car for that added bit of shine and lubrication. I'm on my second bottle and I honestly don't think I'll wash my BMW without it ever again. Just ordered my 2nd bottle of this amazing product! I've got 6 or 7 bottles of similar product but NOTHING I've purchased comes close to the results I get from Optimum. I listen to other detailers and try other companies quick detailer but they're all subpar in comparison. Whatever Optimum is doing is definitely working! I'm a customer and consumer for life! "KEEP IT GLOSSY"
Excellent quick detailer. Removes smudges, adds depth & shine, leaving a slick surface. I also like to use as a drying aide after using ONR for additional POP. Certainly will buy again.